Over the years I had spoken to so many people who agreed with me about need to write. ‘’Oh the stories I could tell’’ was a familiar line. ‘’I could write a book’’ was another. On that basis, I assumed I’d have people queueing up to join The Scribblers’ Club. When people didn’t understand what scribblers did, I explained it was a creative writing. ‘’Oh, you mean like calligraphy’’ said one woman. When people said they had a problem with punctuation and spelling, I tried to explain that it didn’t matter, but it was no use. I soon realised that they were afraid to put their heads above the parapet. It’s one thing telling a story in a bar or around a water cooler, but writing it down was a whole different experience. I soon learned that people lacked confidence when it came to writing and the idea that their efforts would be open to scrutiny scared them. I took these lessons on board as I made up the rules for our group. People should be allowed to write as they please in whatever style they like. As we do not show our work to anyone – we just read them to each other – there is no need to worry about spelling, punctuation or grammar. It’s the story that matters. There should be no criticism of anyone’s work. After all, it’s just fun. Fear of failure haunts us all, but when you write for pleasure, failure is not an option. Like learning to swim, the more you do, the better you get. At the first attempt, I got the names of eighteen people who assured me that they would turn up on the day. Only four did. Luckily, I had friends on standby who helped make the numbers up. My other biggest fear was that I would dry up and have nothing to say, which, through a mixture of nerves and inexperience, was almost the case. 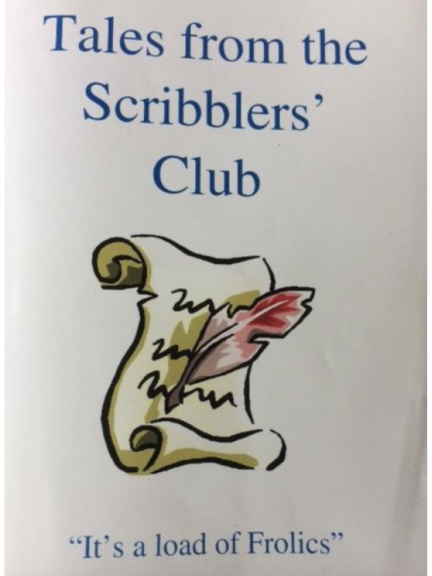 But the Scribblers’ Club was up and running. I didn’t dry up and I managed to answer the many questions thrown at me. It seems such a long time ago now, but in the intervening years, we have made huge strides. We even brought out a collection of our stories last year to the great satisfaction to all concerned. Alas, we only had 60 copies printed and they all went to the scribblers and their families. It was a just reward for all their hard work and loyalty to the club.